The cameras have largely left, but this week, we were reminded that the story of our Little Ukraine On The Virgin River continues. First, there were reports that militiamen (largely from other states), having stayed behind after the standoff and apparently lacking anything else to do, have been harassing the locals and demanding their papers. There also came word of infighting among the various militia groups camped out at the Bundy Ranch, a predictable result considering that we are talking about a movement where every man fancies himself a colonel. To the media’s credit, reporting on this story has largely made it clear that this insurrection was not an isolated incident, but merely a fairly extreme manifestation of a long-standing conflict between rural westerners and a Federal government which they simultaneously depend upon and rail against. While most would trace this back to the Sagebrush Rebellion of the 1970s, those more familiar with the history of the western states see this current running back into the 19th century. Folks who want insight into the roots of this might do well to check out two books, one a scholarly history and the other fiction, about a spectacular crime that occurred in Arizona in 1889. 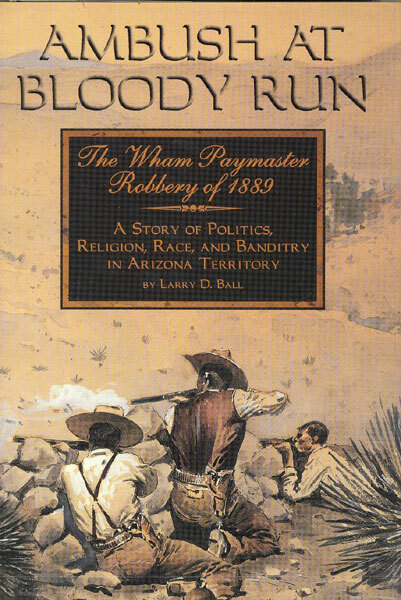 Ambush at Bloody Run: The Wham Paymaster Robbery of 1889- A Story of Politics, Religion, Race and Banditry in Arizona Territory by Larry D. Ball (2000) tells of an incident when a gang of Mormons in Graham County held up a U.S. Army pay wagon bound for Fort Thomas with twenty-eight thousand dollars. As implied by the title of the book, the crime, investigation, and subsequent trial provide an excellent window into many of the conflicts that came to shape our state. Coming at a time when an ascendant progressive movement was becoming more prominent, the events pitted figures from the two emerging factions of Arizona’s Democratic Party against each other: on one side progressives like former Representative Selim Franklin and Arizona Star editor (as well as future Governor) Louis Hughes versus conservatives like Territorial Delegate (and future U.S. Senator) Marcus A. Smith, who neglected his duties in Washington D.C. to defend the gang when they went on trial in Tucson. One of the things that becomes clear in this book is that that, unlike today, the military was not spared from the anti-government rhetoric of the era. The peacetime Army was regarded as a nuisance, and soldiers were regarded as freeloaders. Because the soldiers at Fort Thomas were largely African-American “Buffalo Soldiers” of the 24th Infantry, racism was a factor as well. It is only in this context that it starts to make sense that a significant number of Arizona residents regarded the theft of thousands of dollars of taxpayer money to be no big deal, even if 8 men were wounded in the process. Of course, then as now, these attitudes were tainted by hypocrisy. In this case, the gang’s ringleader Gilbert Webb had a contract to provide grain to the Army. In other words, he was financially dependent on the same soldiers that he robbed. The novella “A Pilgrim on the Gila” by Owen Wister (1895), a political satire inspired by the same incident, similarly rings true today. Except for two uncomfortable passages, where a character based on African-American woman gambler Frankie Campbell (who Ball’s narrative shows as one of the most fascinating characters to emerge from the incident) is reduced to a dated, panicky mammy stereotype, the sophisticated, cynical humor mostly still works after all these years. The author, who was visiting Fort Thomas when all this happened, is someone whose name may not be familiar, but we have all been affected by his influence on popular culture. Wister’s novel The Virginian: A Horseman of the Plains, is widely regarded one of the first westerns, and he is credited with creating many of the conventions of the genre. Wister’s own politics, which come through in his writing, were considered conservative even in his own time, and today he would probably be a Republican in the snobbish authoritarian mold of Michael Bloomberg. But whether you not come away agreeing with the politics behind them, “Pilgrim” and his other works show that the rugged individualism of the west always inspired controversy. I supposed it something local then, but have since observed it to be a prevailing Western antipathy. The ill thinking sons of the sage-brush ill tolerate a thing which stands for discipline, good order and obedience, and the man who lets another command him they despise. I can think of no threat more evil to our democracy, for it is a fine thing diseased and perverted–namely, independence gone drunk. “Pilgrim” goes in and out of print, though it is often anthologized. One such collection be found for free here. While there are few similarities or outright parallels between what is going on in Nevada today and what happened in Southern Arizona in 1889, anyone who checks out these books will find sentiments and conflicts that still sound strangely familiar. Previous articleHuppenthal tries to expand school vouchers by executive fiat – can you say ‘lawsuit’!